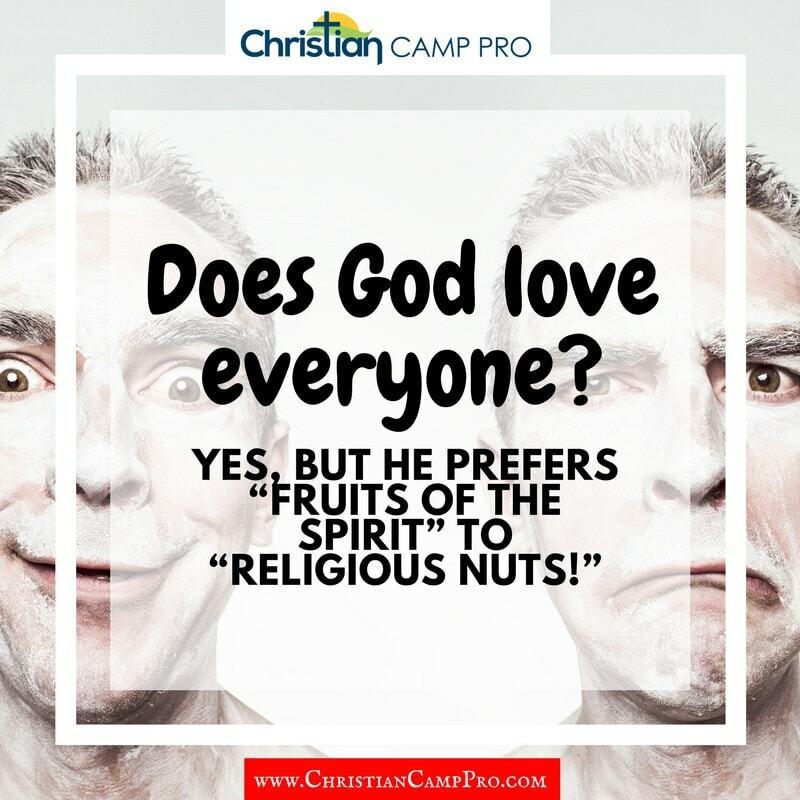 Opening with one or a small set of funny Christian jokes is a great way to lighten the mood and get people laughing. 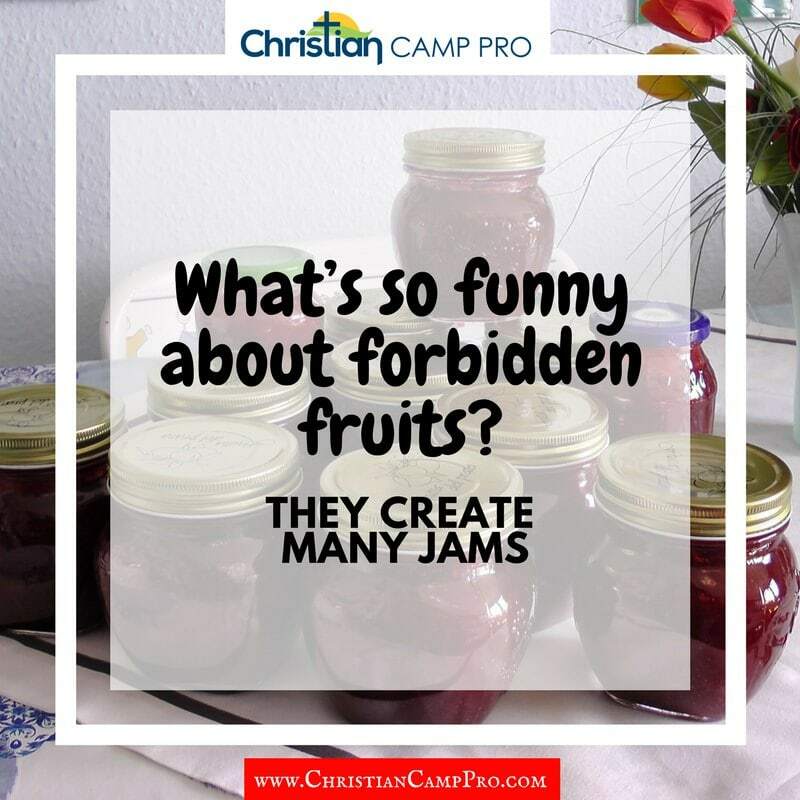 Safe, clean and funny Christian jokes can be used in a wide variety of situations such as: comedic relief in a message, keeping a youth group entertained on a long bus ride, bringing everyone to attention at the start of a service, serving as an icebreaker when meeting new people at a Christian retreat or camp meeting or even bringing down barriers that we may create for ourselves at other church social events. 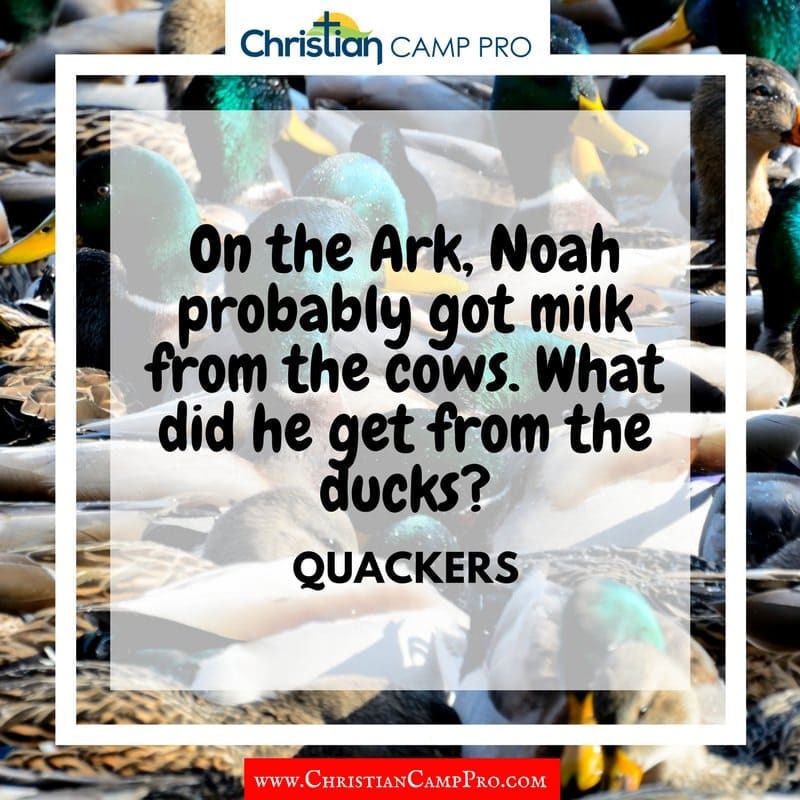 This post was recently updated to include a total of 43 of the best Christian jokes! 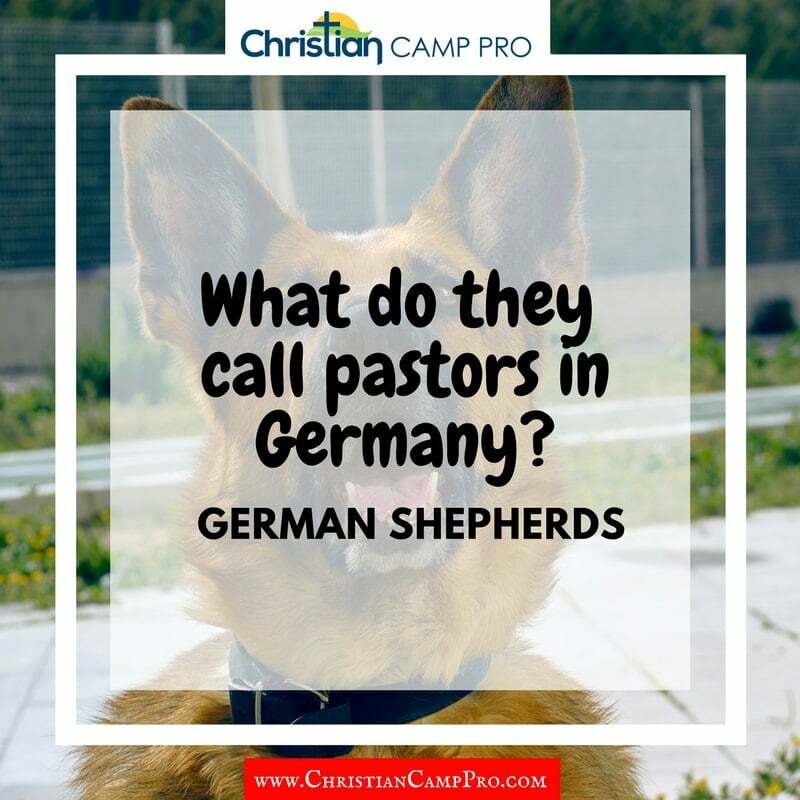 If you’re like me, you love a good joke and since short (one-liner), funny Christian jokes are kind of hard to come by, we’ve started a new list of funny Christian jokes for you to use at your next retreat, camp or any other Christian event. 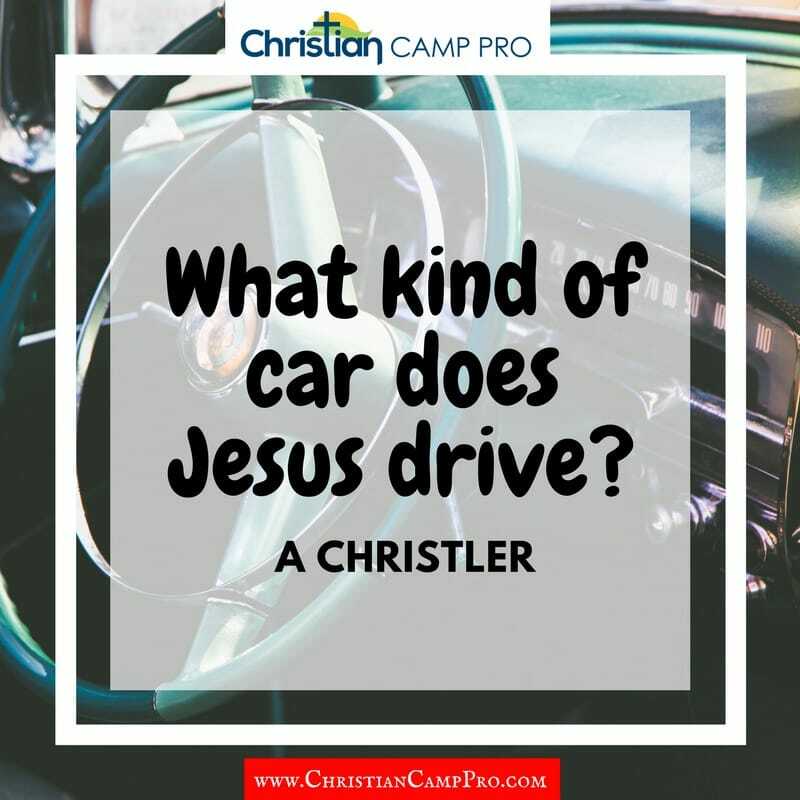 This post is intended to be a constantly growing list of the best Christian jokes and updated frequently. 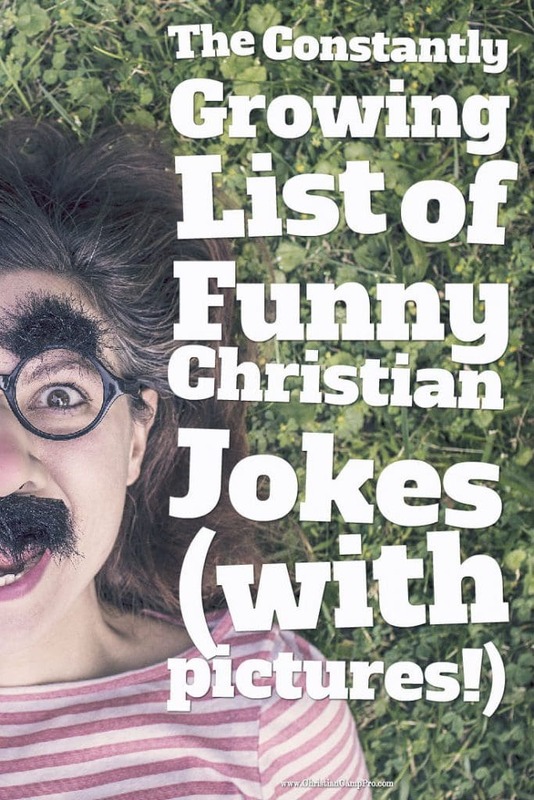 All of the funny Christian jokes below are easily shareable too! Be sure to hover over any image to easily share your favorites on your preferred social network. Also, feel free to copy any joke themed image into your speaking presentations for a quick laugh. 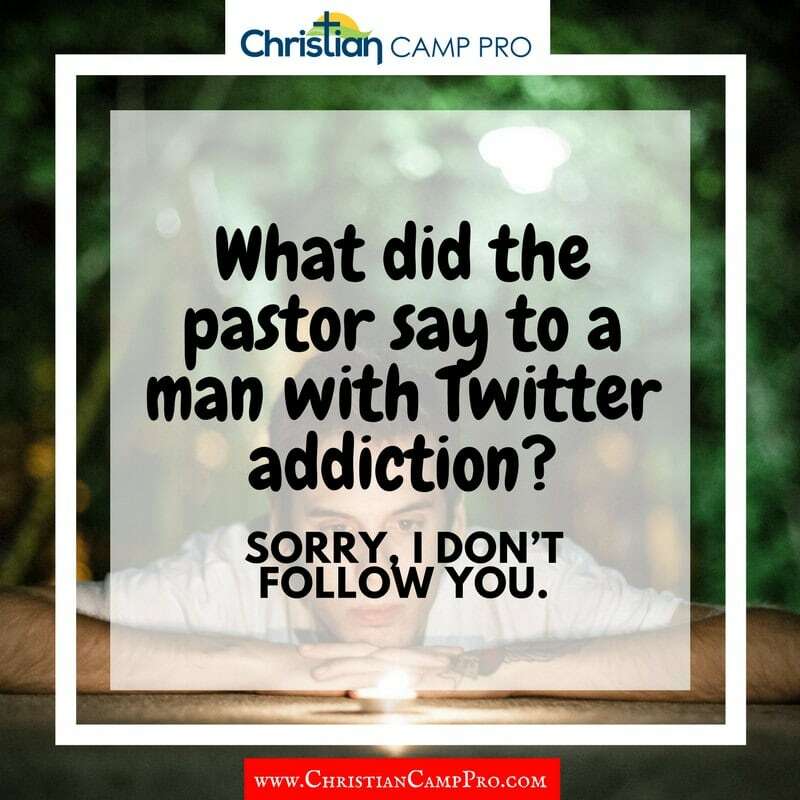 What did the pastor say to a man with Twitter addiction? -Sorry, I don’t follow you. 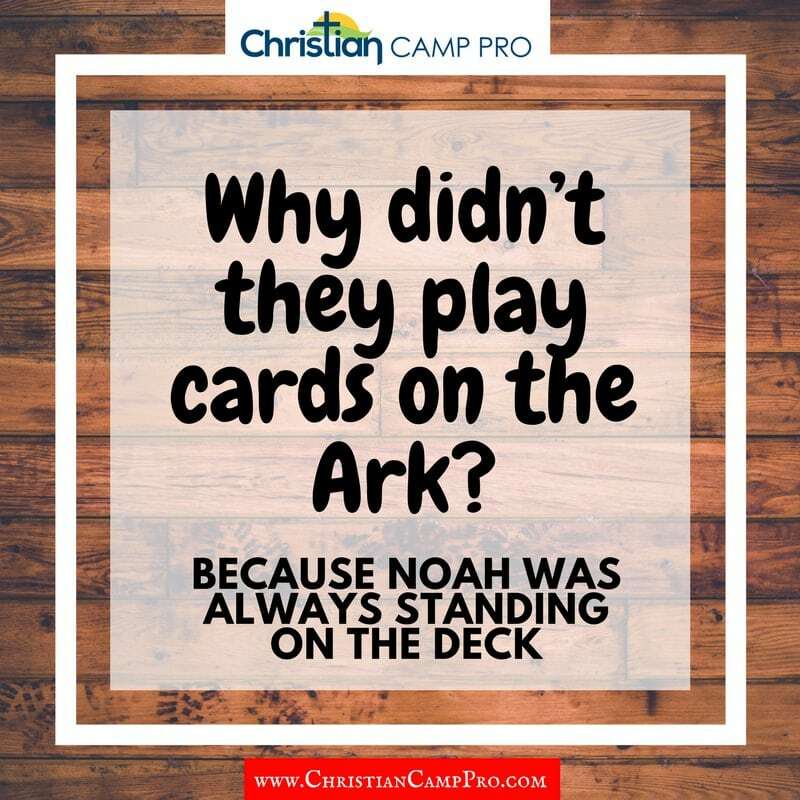 Why didn’t they play cards on the Ark? -Because Noah was always standing on the deck. 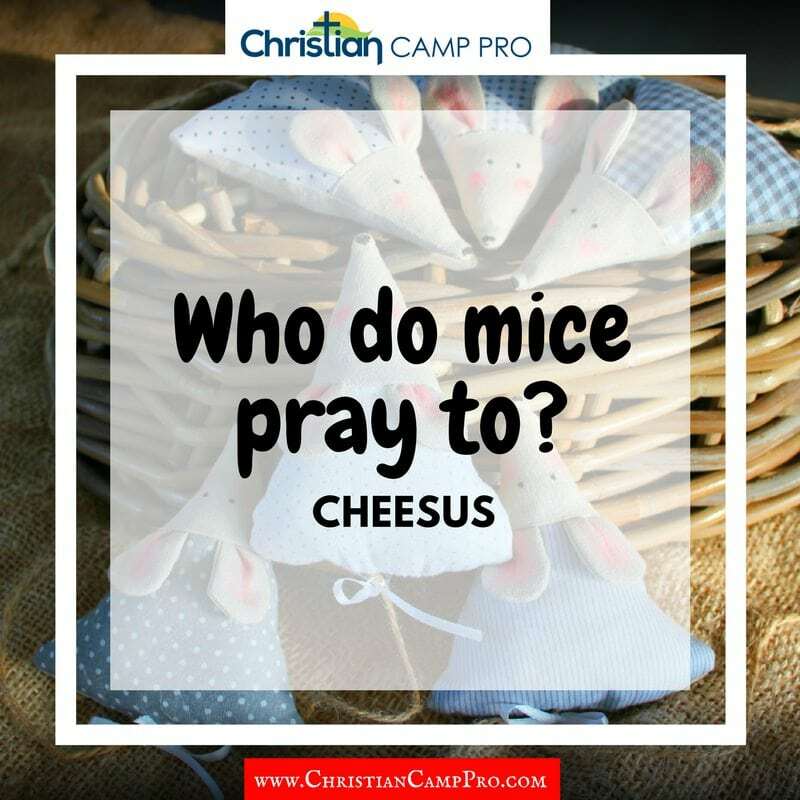 Who do mice pray to? Cheesus! Why didn’t Noah ever go fishing? 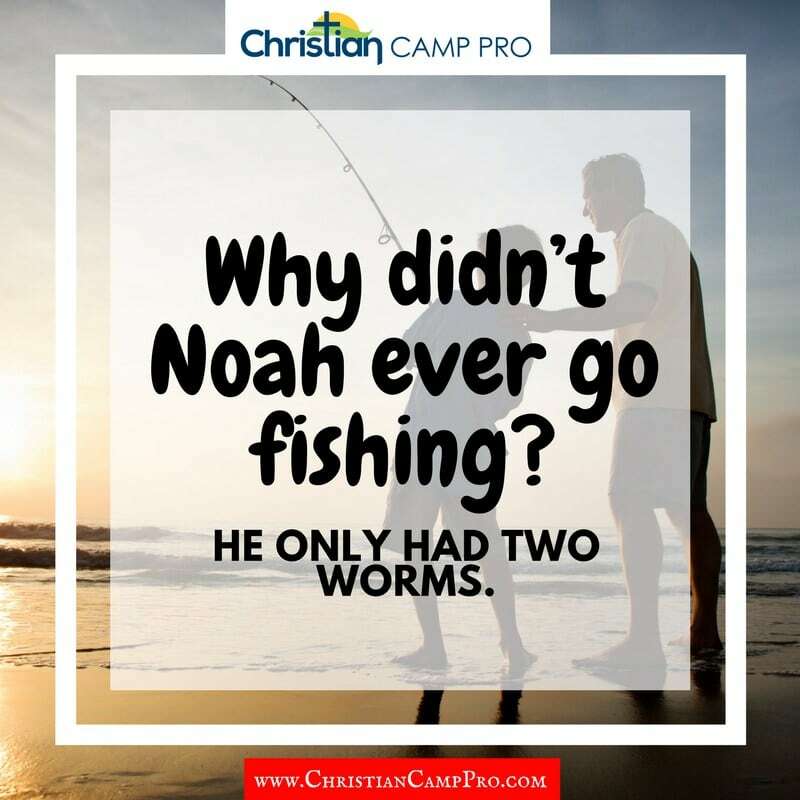 -Because he only had two worms. 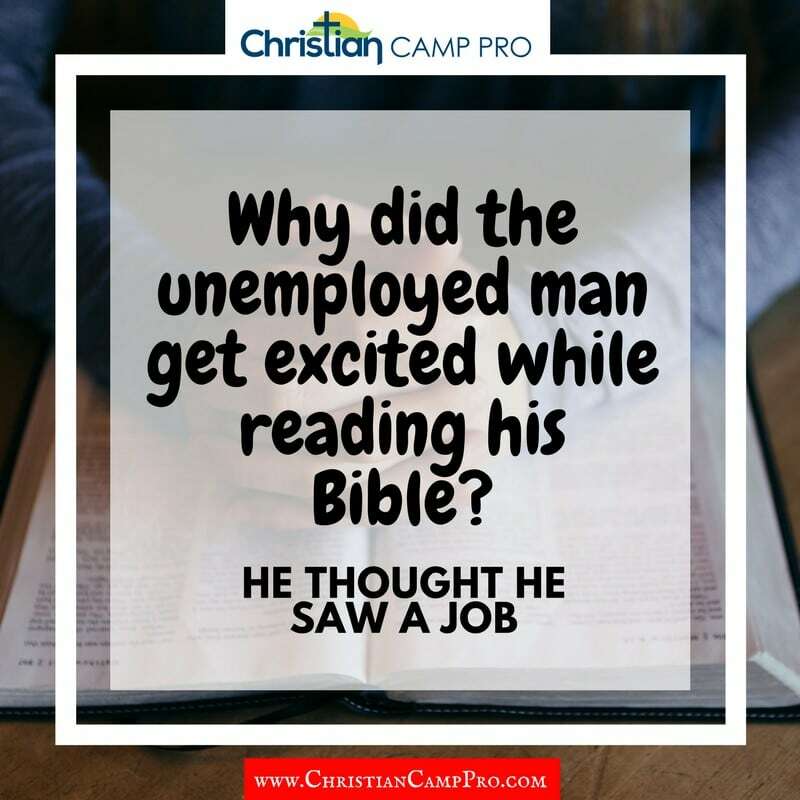 Why did the unemployed man get excited while reading his Bible? -He thought he saw a job. 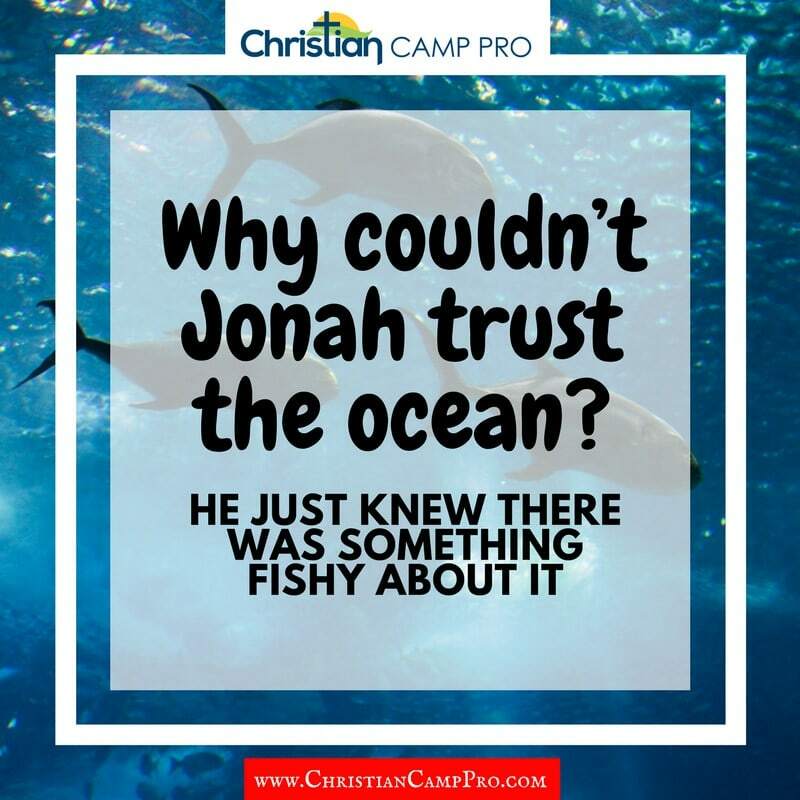 Why couldn’t Jonah trust the ocean? -He just knew there was something fishy about it. 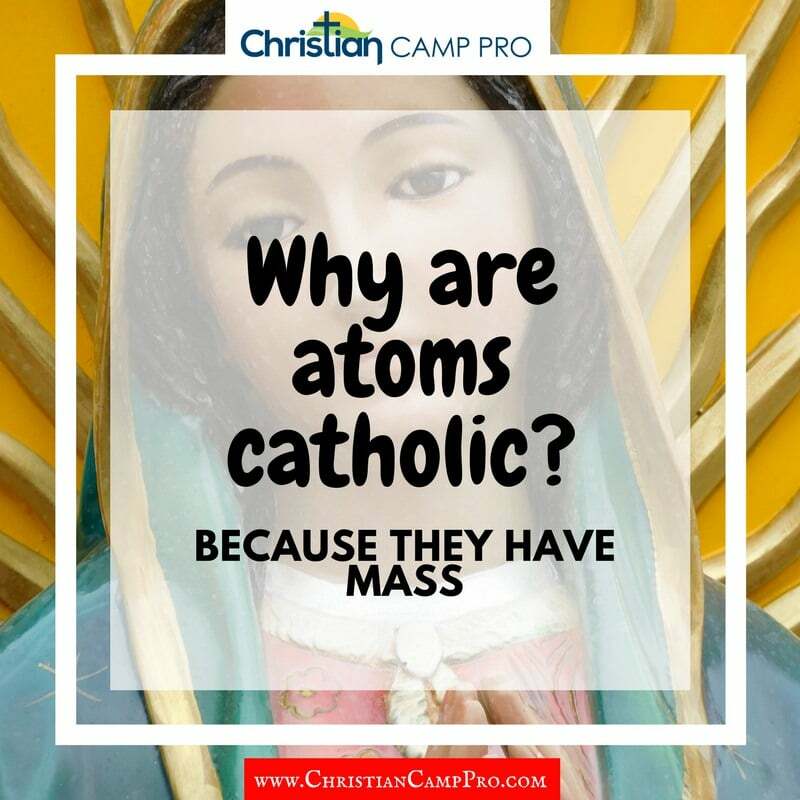 Why are atoms catholic? Because they have mass. 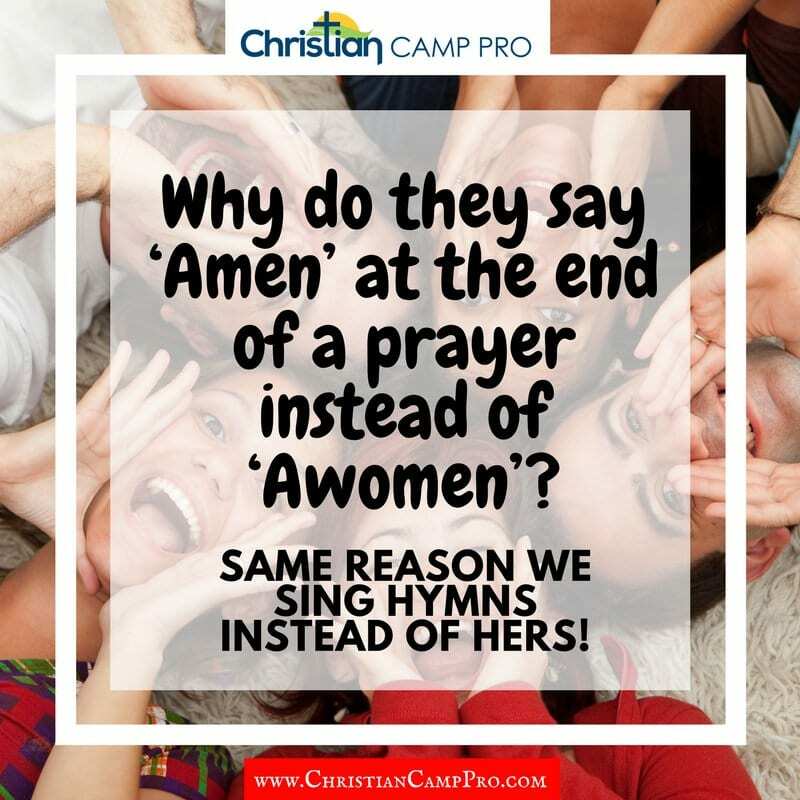 Why do they say “Amen” at the end of a prayer instead of “Awomen”? 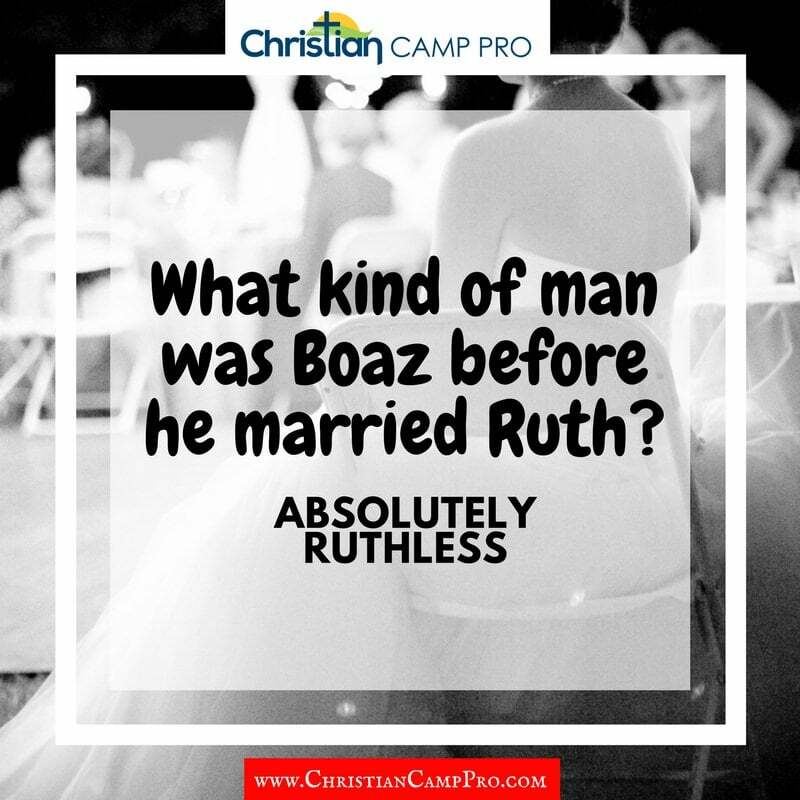 Same reason we sing Hymns instead of Hers. 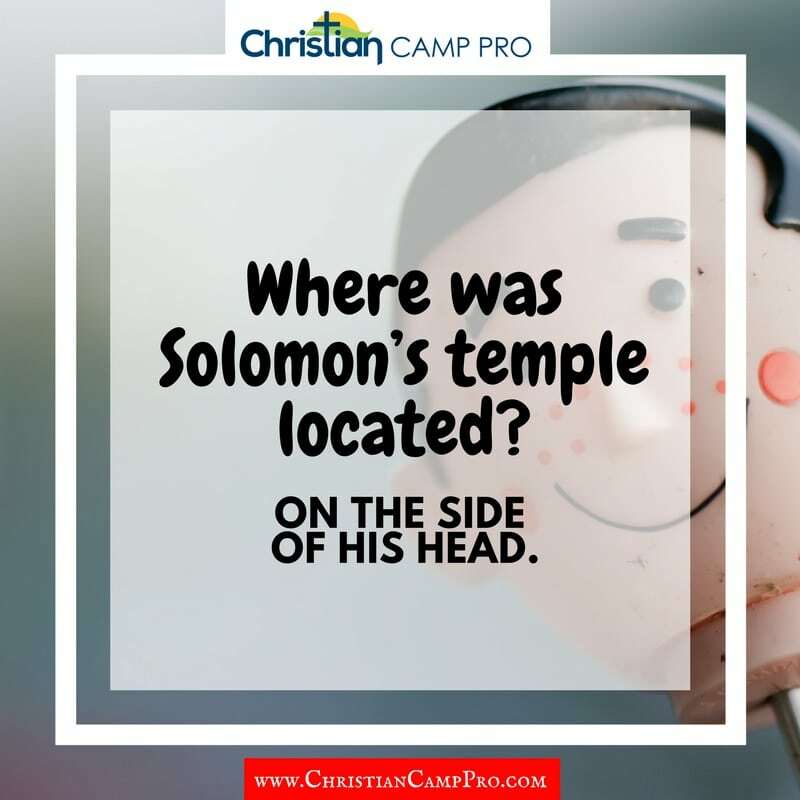 Where was Solomon’s temple located? On the side of head. 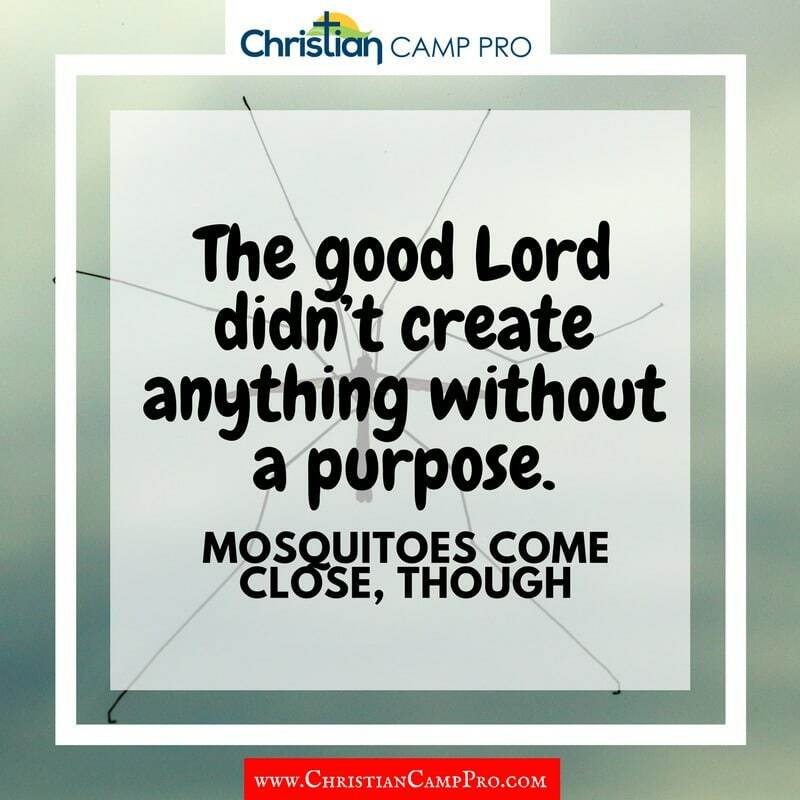 The good Lord didn’t create anything without a purpose. Mosquitoes come close, though. 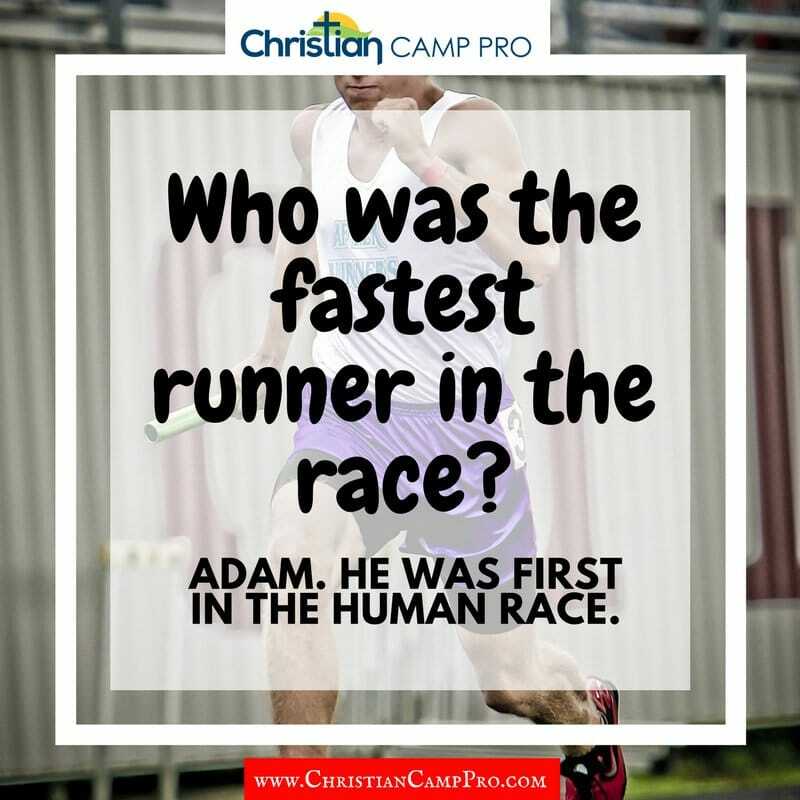 Who was the smartest man in the Bible? 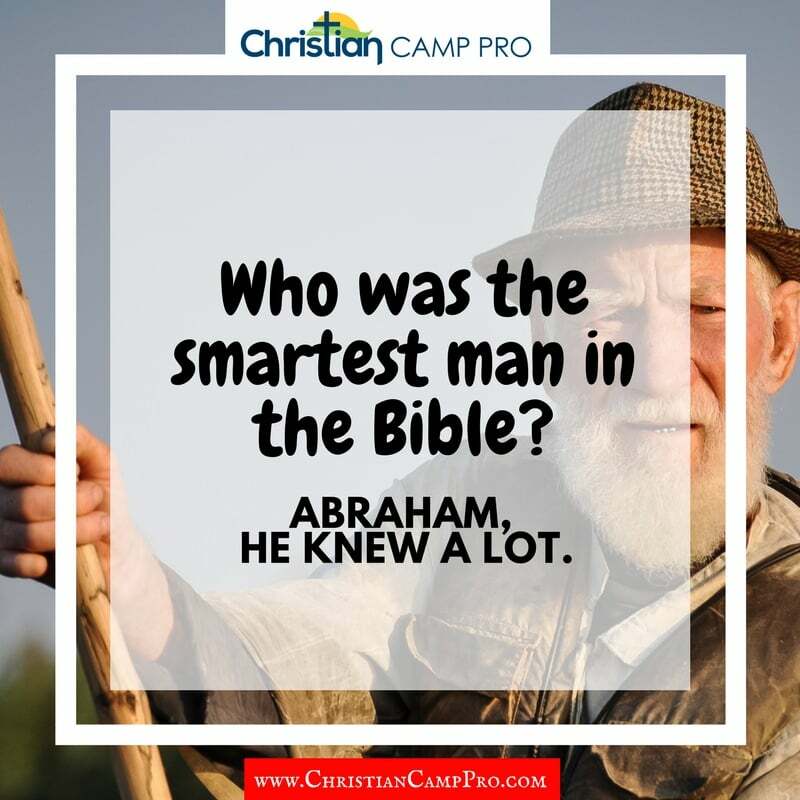 Abraham, he knew a Lot. 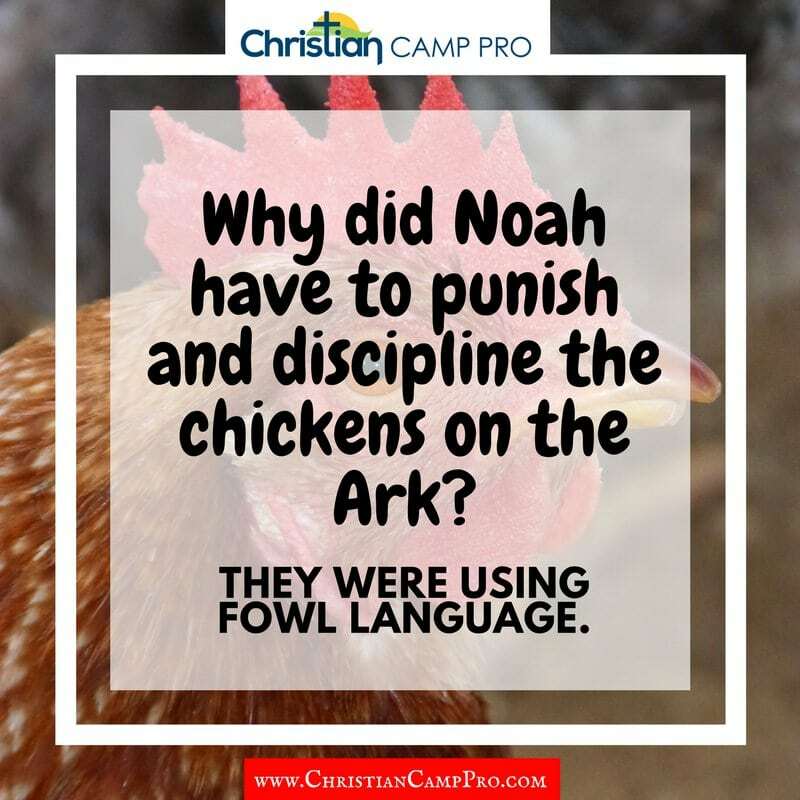 Why did Noah have to punish and discipline the chickens on the Ark? They were using fowl language. 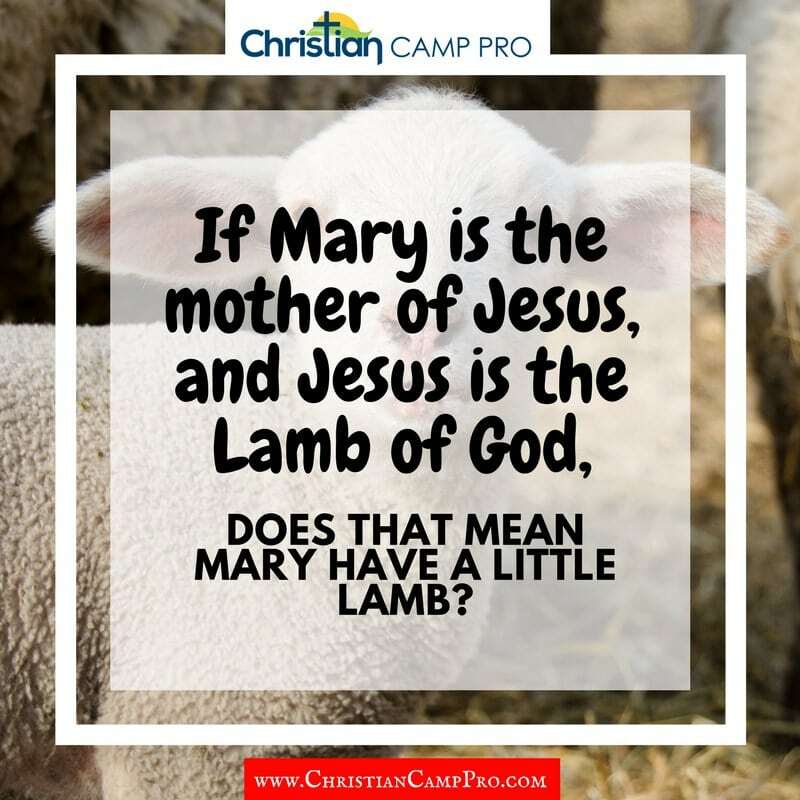 If Mary is the mother of Jesus, and Jesus is the Lamb of God, Does that mean Mary had a giggle lamb? 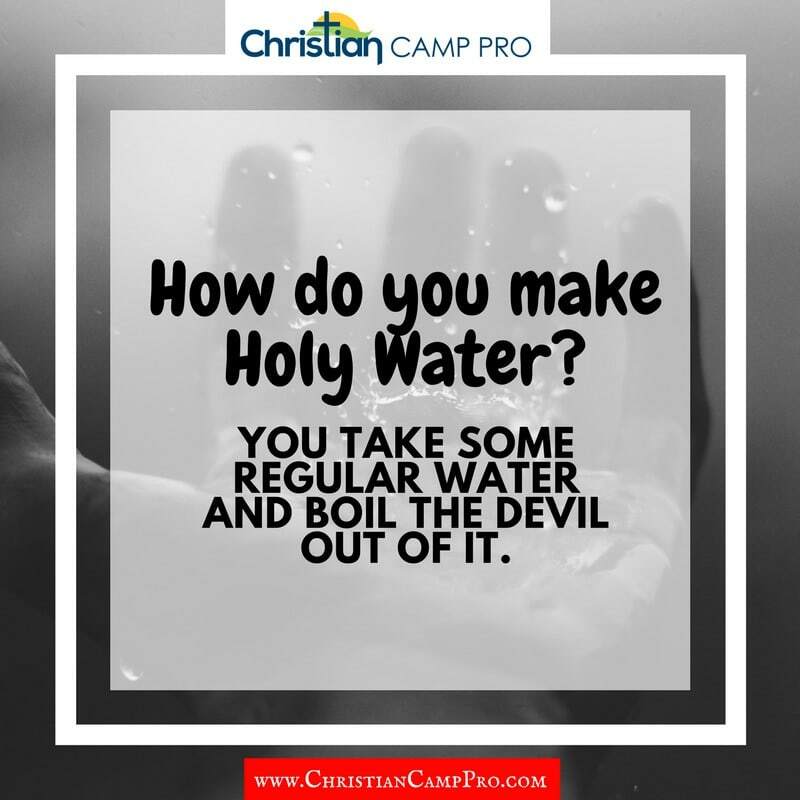 How do you make Holy Water? You take some regular water and boil the devil out of it. 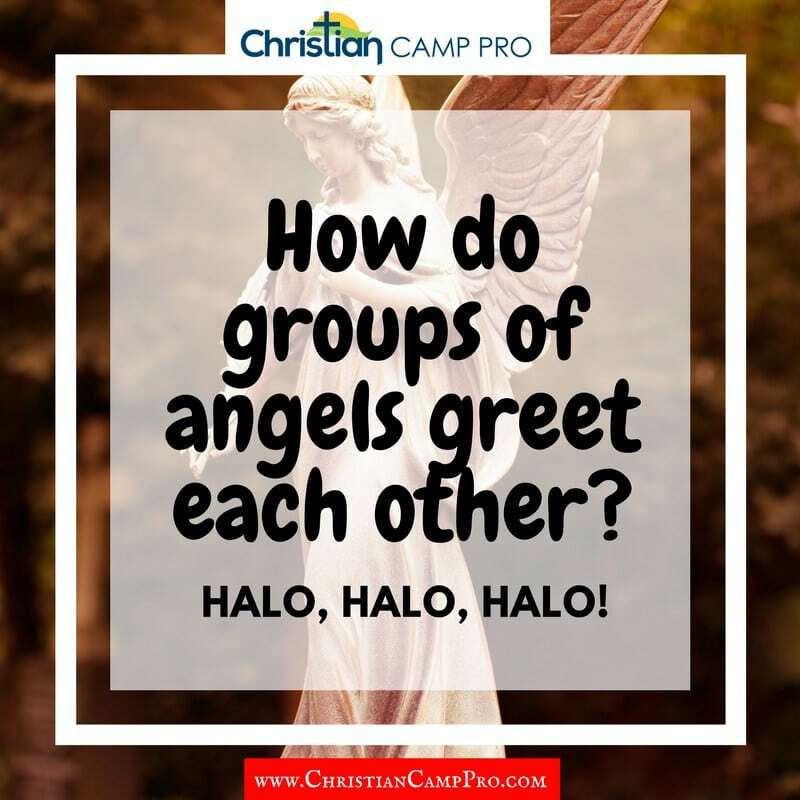 How do groups of angels greet each other? Halo, Halo, Halo! 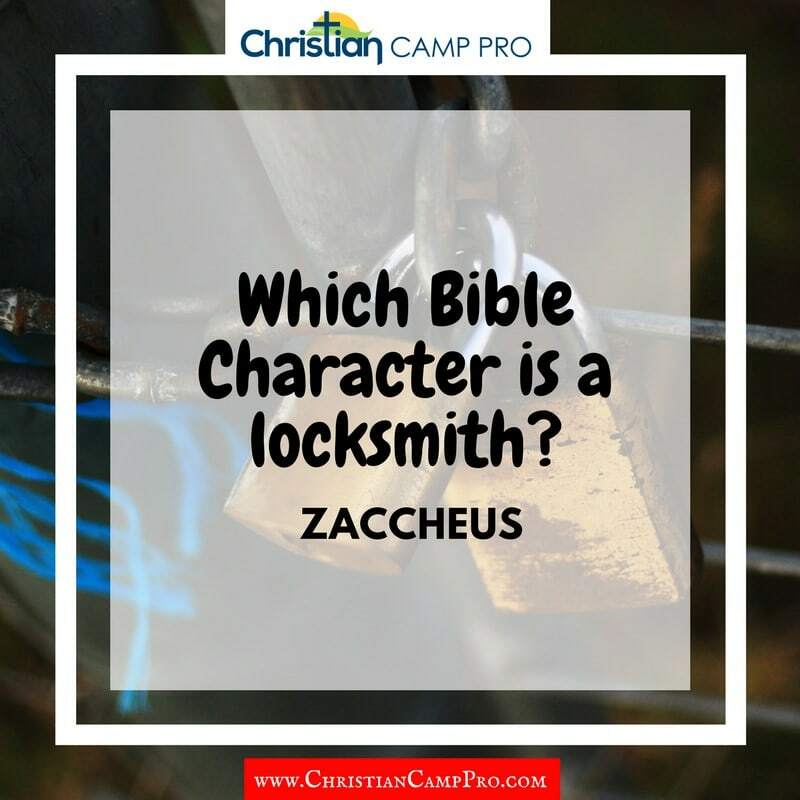 Who was the greatest investor in the Bible? 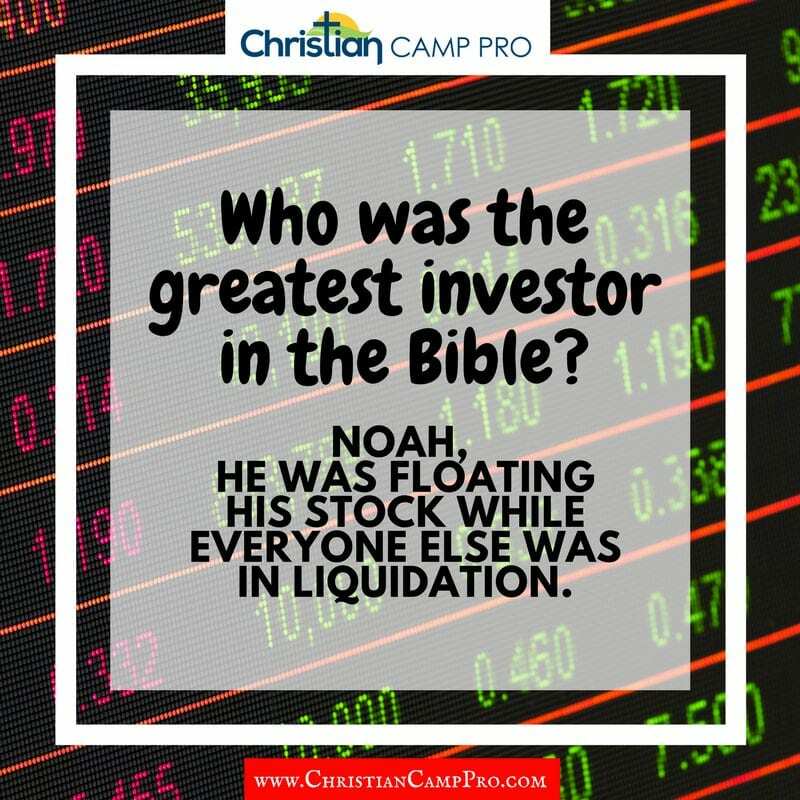 Noah, he was floating his stock while everyone else was in liquidation. 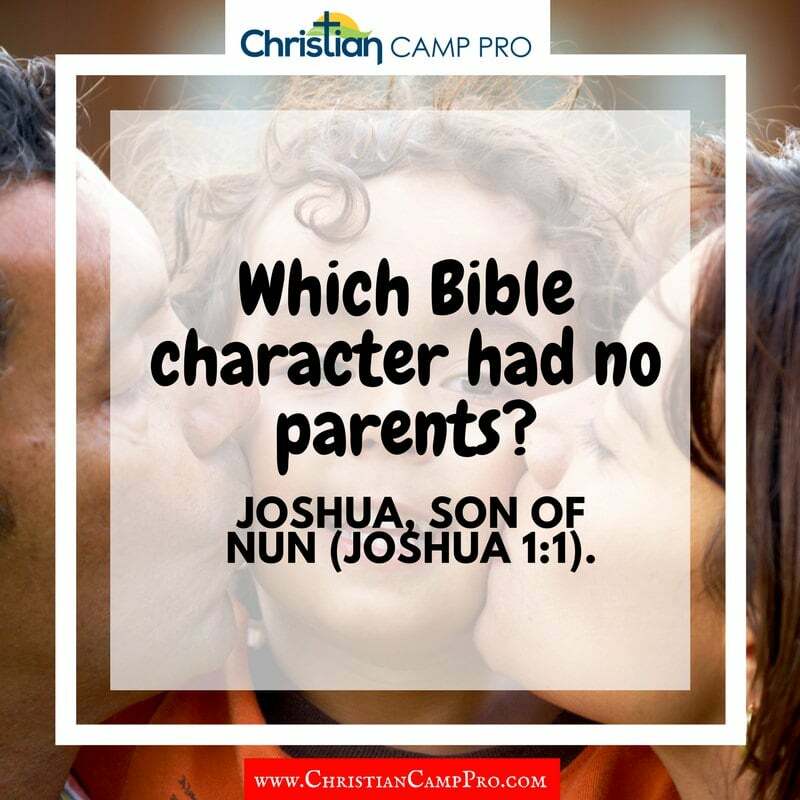 Who was the great baby sitter mentioned in the Bible? 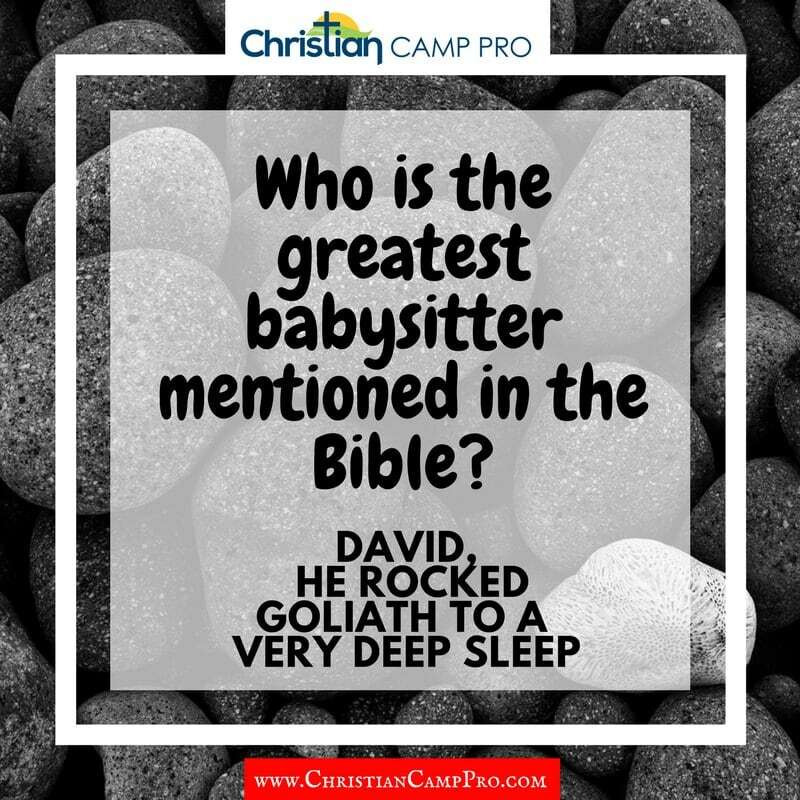 David, he rocked Goliath to a very deep sleep. 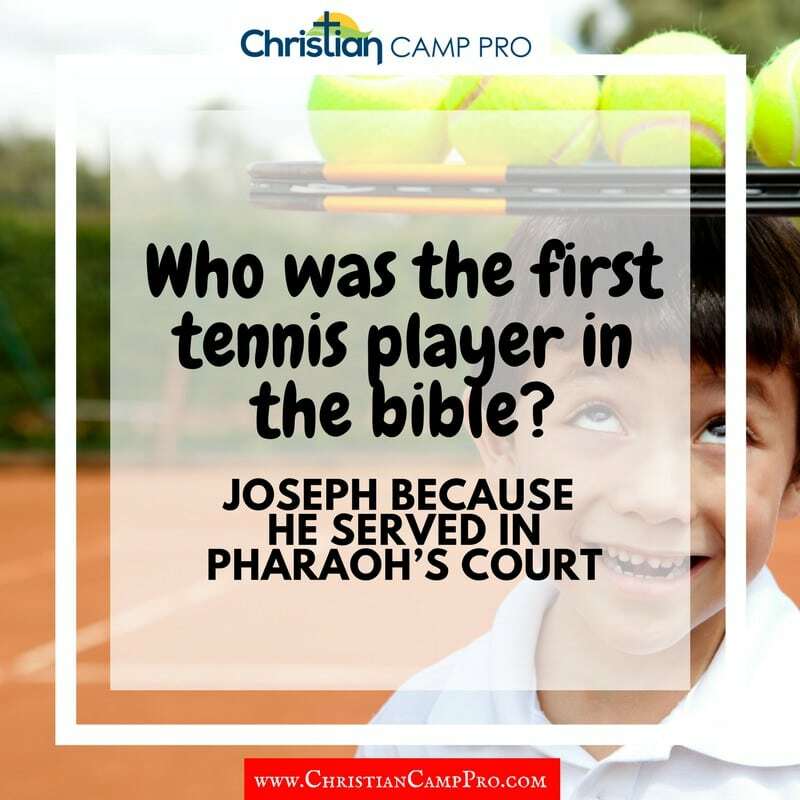 Who was the first tennis player in the Bible? Joseph because he served in pharaoh’s court. 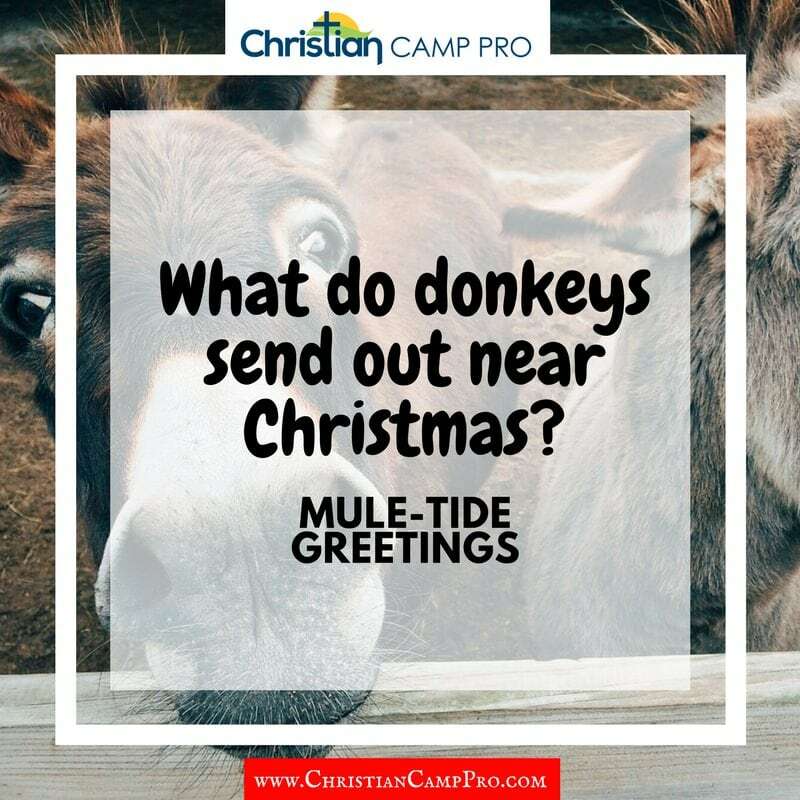 What do donkeys send out near Christmas? Mule-tide greetings! 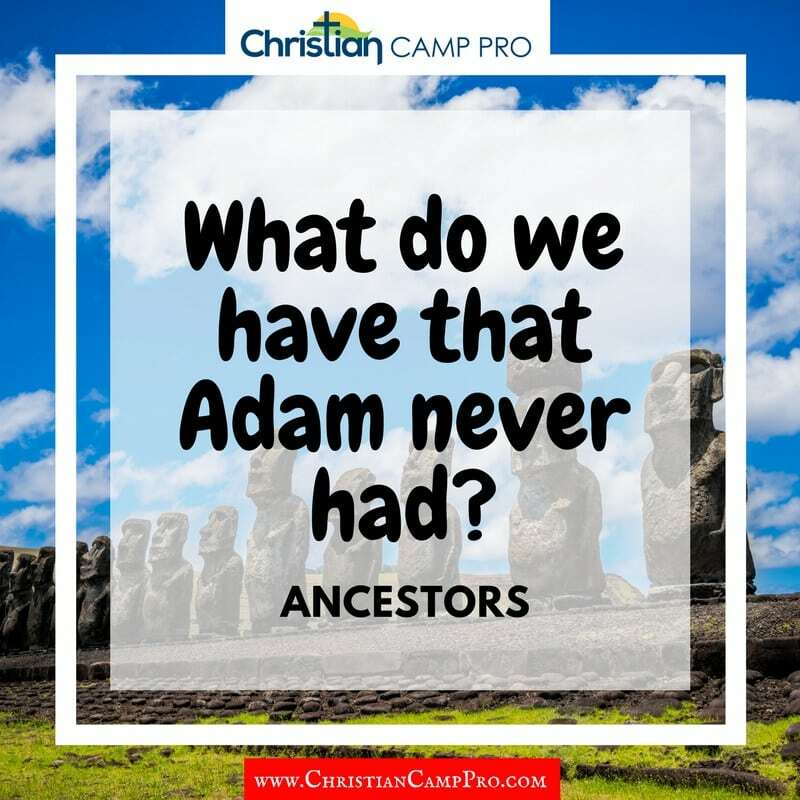 Did eve ever have a date with Adam? 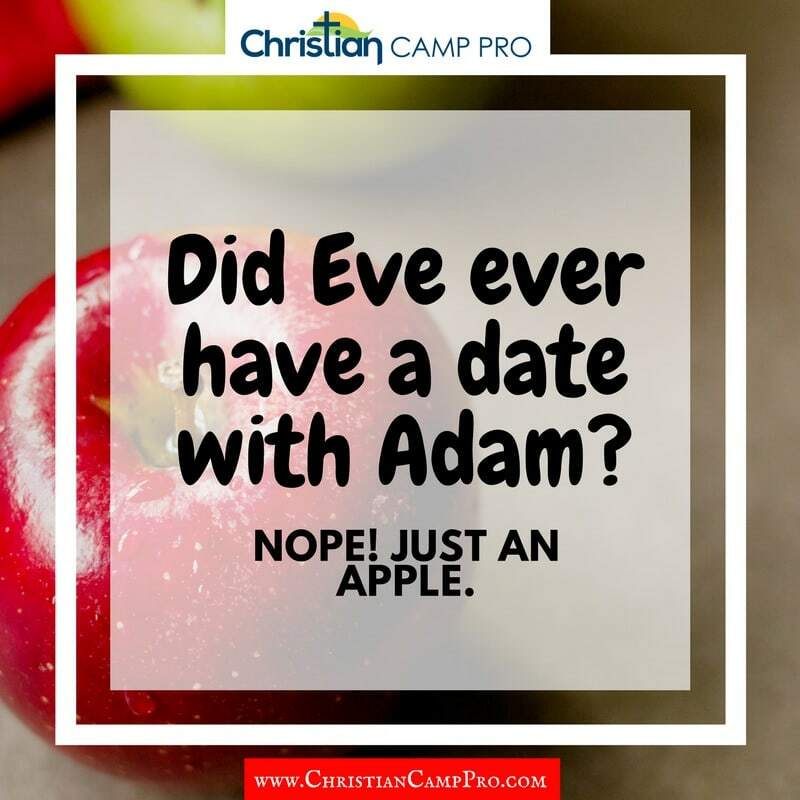 Nope, just an apple. 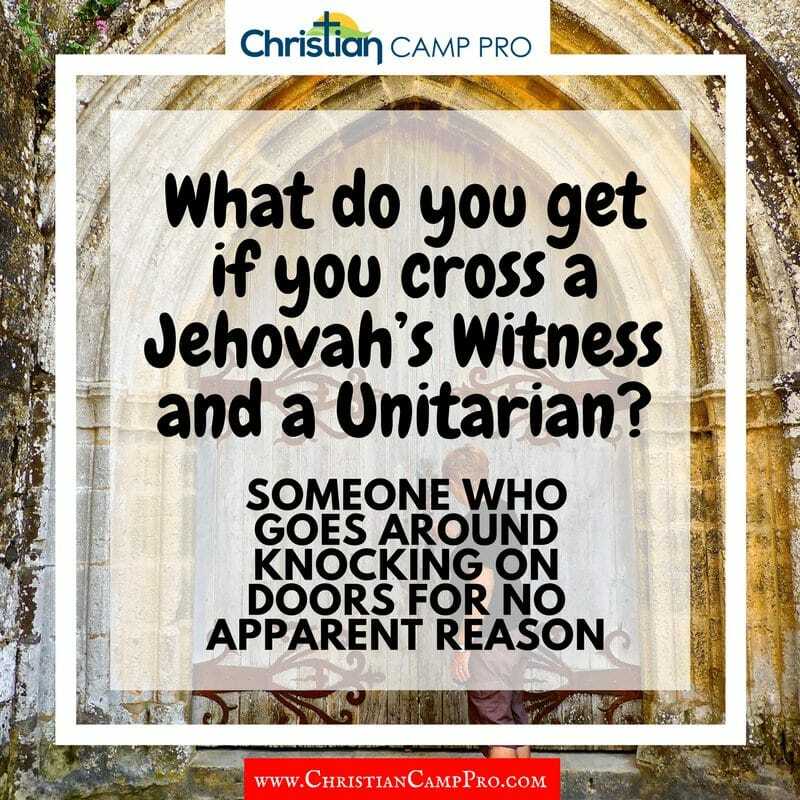 What do you get if you cross a Jehovah’s Witness and a Unitarian? Someone who goes around knocking on doors for no apparent reason. 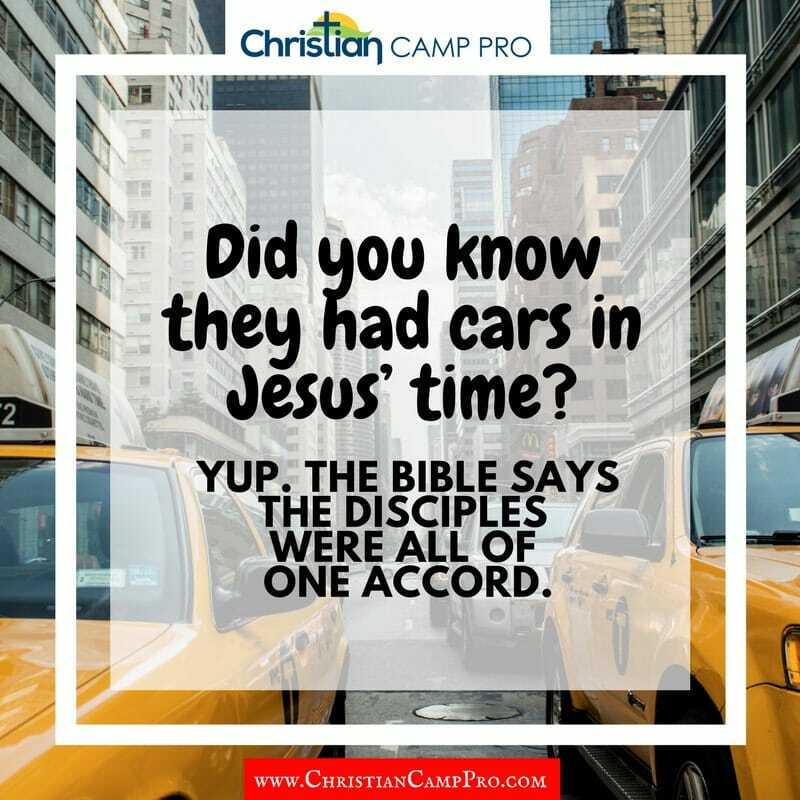 Did you know they had cars in Jesus’ time? Yup, the Bible says the disciples were all in one Accord. 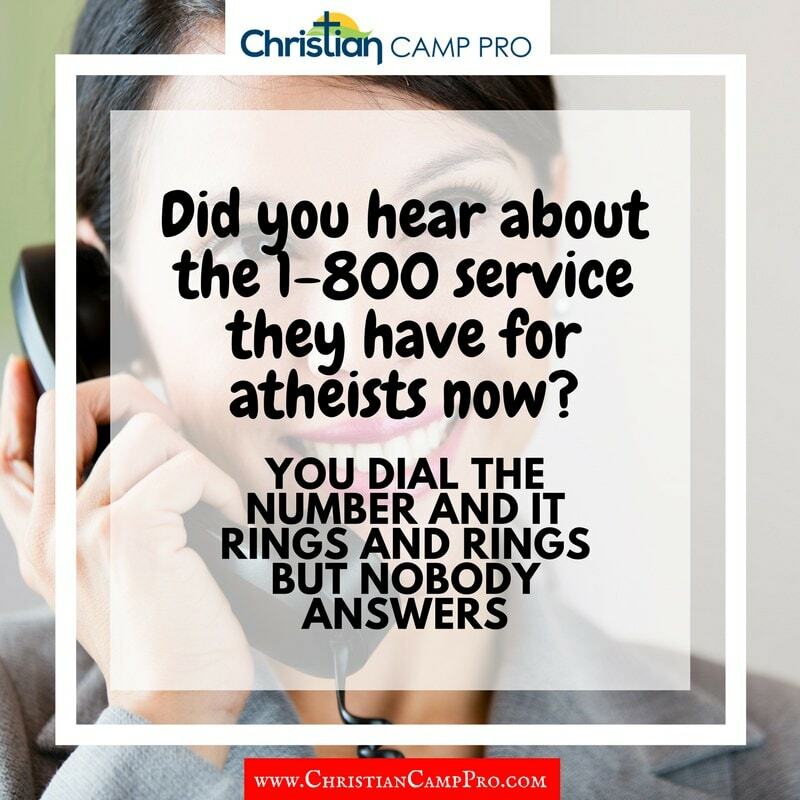 Did you hear about the 1-800 service they have for atheists now? You dial the number and it rings and rings but nobody answers. 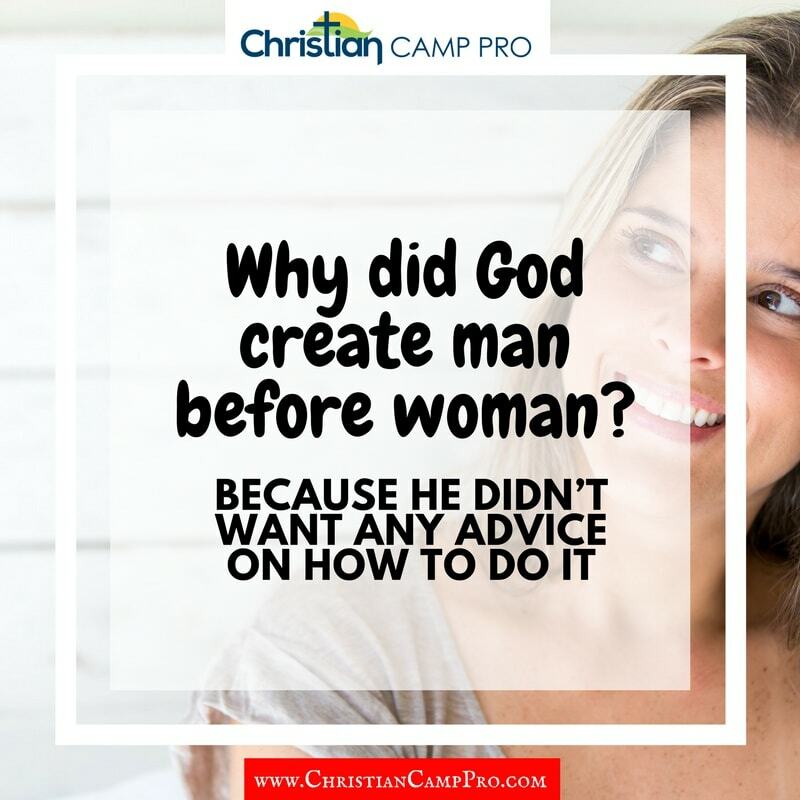 Why did God create man before woman? Because He didn’t want any advice on how to do it. 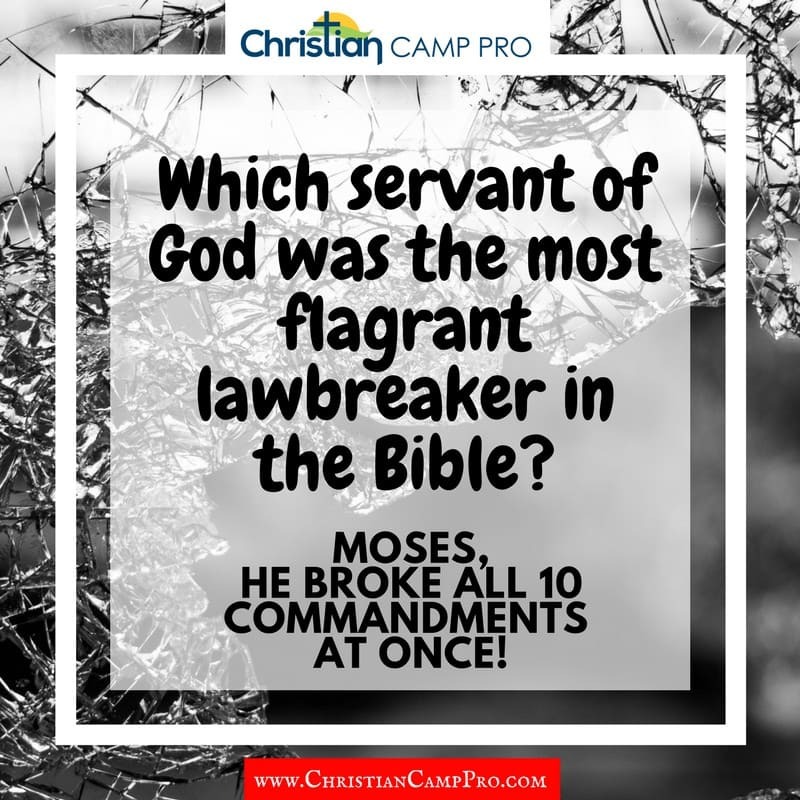 Which Servan of God was the most flagrant lawbreaker in the Bible? 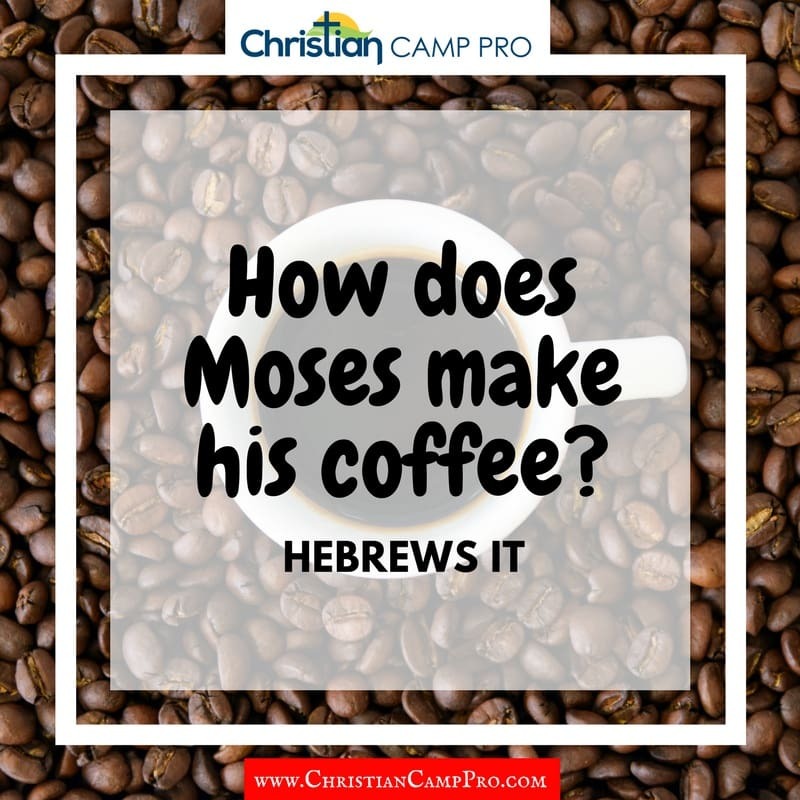 Moses, he broke all 10 commandments at once! 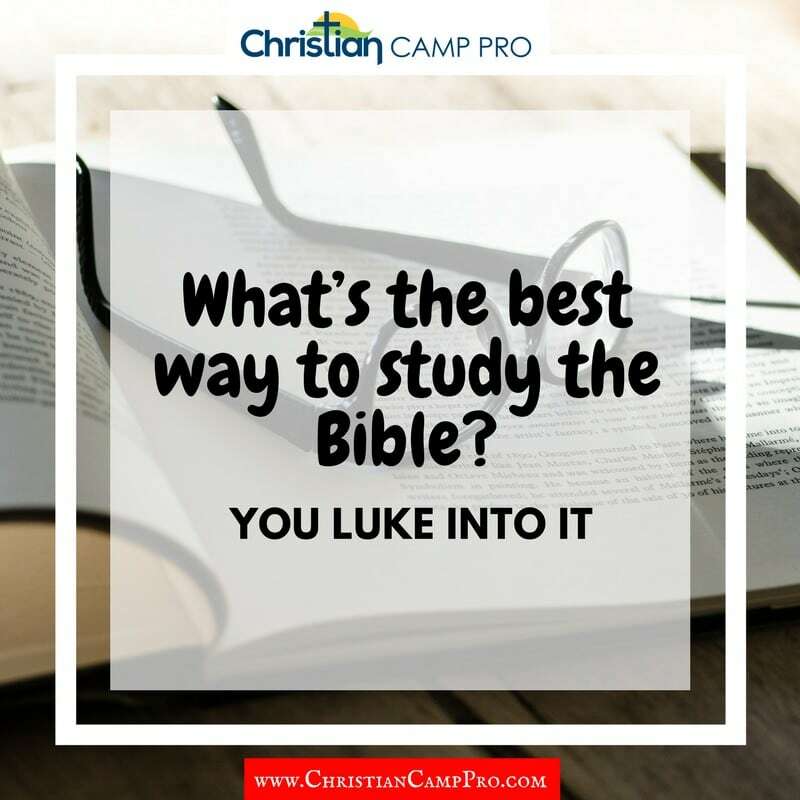 What’s the best way to study the Bible? You Luke into it. 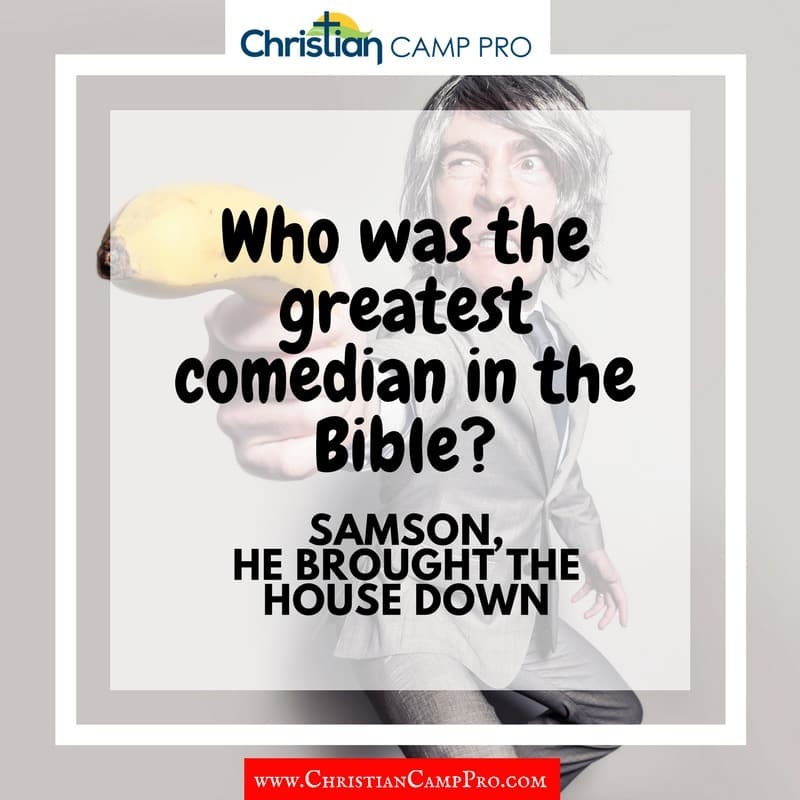 Who was the greatest comedian in the Bible? Samson, he brought the house down. 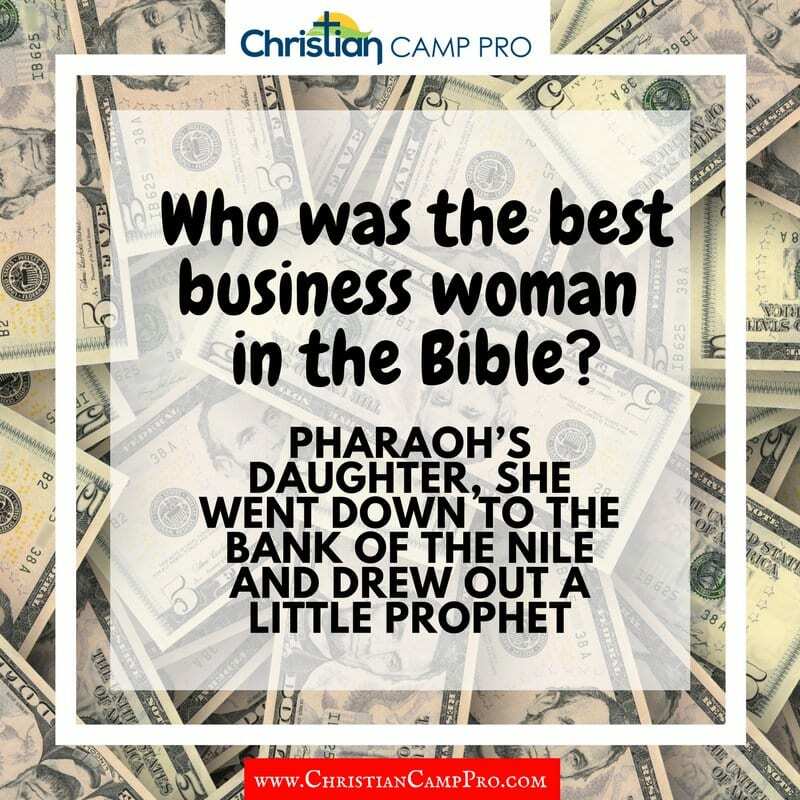 Who was the best business woman in the Bible? Pharaoh’s daughter, she went down to the Bank of the Nile and drew out a little prophet. 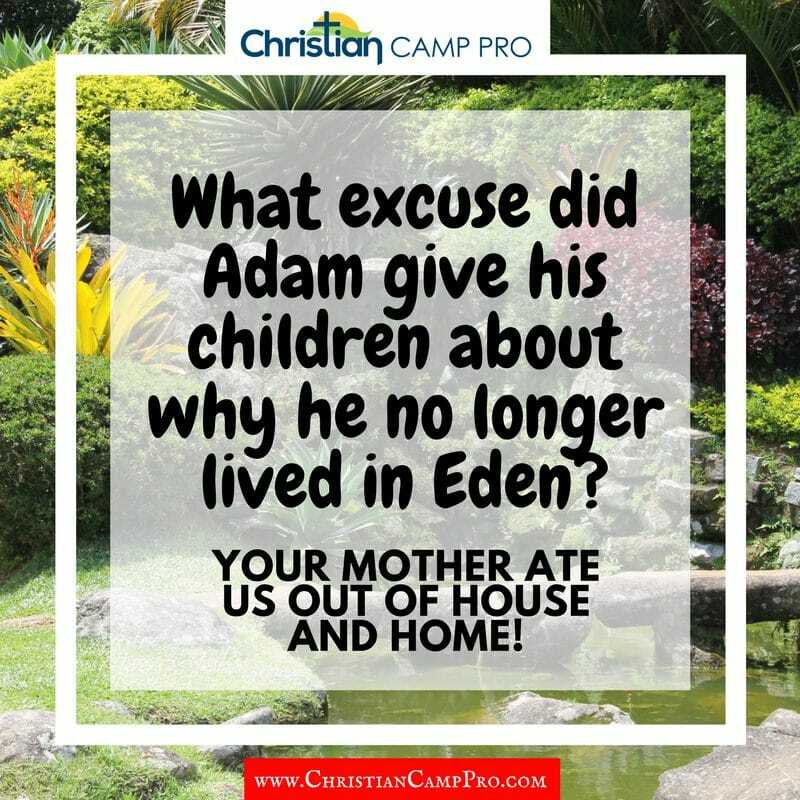 What excuse did Adam give his children about why he no longer lived in Eden? Your mother ate us out of house and home! 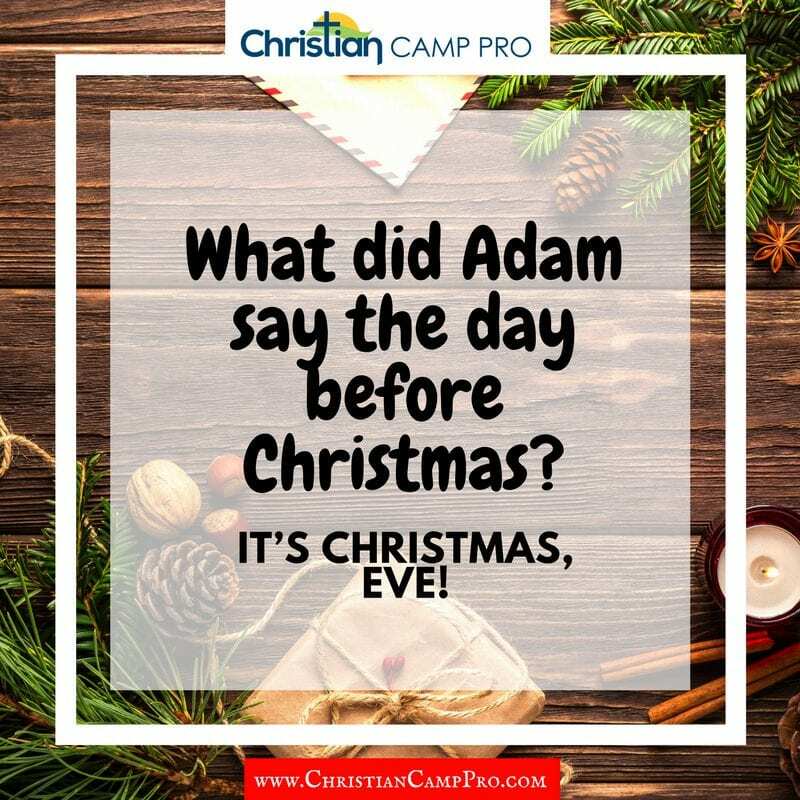 What did Adam say the day before Christmas? 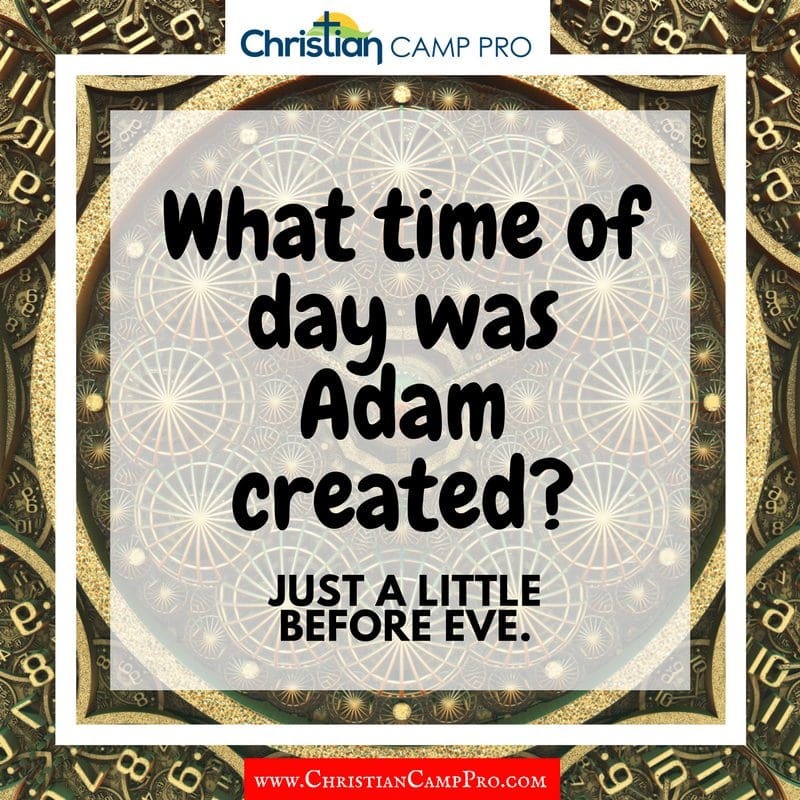 It’s Christmas, Eve!